In 1959, physicist P.W. Anderson conjectured that superconductivity can exist only in objects that are large enough to meet certain criteria. Namely, the object's superconducting gap energy must be larger than its electronic energy level spacing—and this spacing increases as size decreases. The cutoff point (where the two values are equal) corresponds to a volume of about 100 nm3. Until now it has not been possible to experimentally test the Anderson limit due to the challenges in observing superconducting effects at this scale. The Anderson limit arises because, at very small scales, the mechanisms underlying superconductivity essentially stop working. In general, superconductivity occurs when electrons bind together to form Cooper pairs. Cooper pairs have a slightly lower energy than individual electrons, and this difference in energy is the superconducting gap energy. The Cooper pairs' lower energy inhibits electron collisions that normally create resistance. If the superconducting gap energy gets too small and vanishes—which can occur, for example, when the temperature increases—then the electron collisions resume and the object stops being a superconductor. Although they could not directly measure the superconductivity of such tiny objects, the researchers could measure something called the parity effect, which results from superconductivity. When an electron is added to a superconductor, the additional energy is partly affected by whether there is an even or odd number of electrons (the parity), which is due to the electrons forming Cooper pairs. If the electrons don't form Cooper pairs, there is no parity effect, indicating no superconductivity. 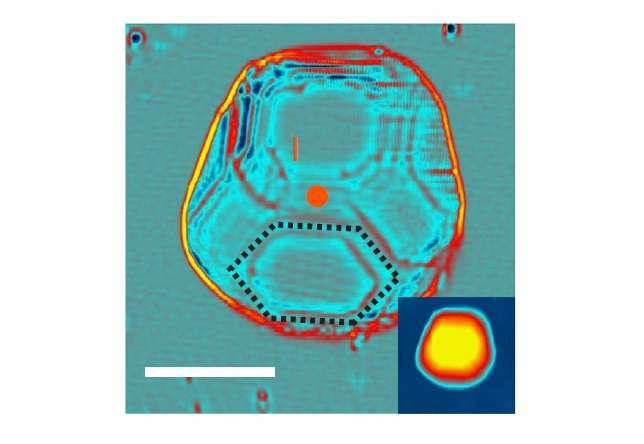 Although the parity effect has previously been observed in large superconductors, this study is the first time that it has been observed in small nanocrystals approaching the Anderson limit. In accordance with Anderson's predictions from more than 50 years ago, the researchers observed the parity effect for larger nanocrystals, but not for the smallest nanocrystals below approximately 100 nm3. "Our experimental demonstration of the Anderson conjecture is also a demonstration of the validity of the Richardson-Gaudin models," coauthor Hervé Aubin at the University Paris Sciences et Lettres and CNRS told Phys.org. "The Richardson-Gaudin models are an important piece of theoretical works because they can be solved exactly and apply to a wide range of systems; not only to superconducting nanocrystals but also to atomic nuclei and cold fermionic atomic gas, where protons and neutrons, which are fermions like electrons, can also form Cooper pairs." "One of the most interesting applications of superconducting islands is their use as Cooper pair boxes employed in quantum bits, the elemental unit of a hypothetical quantum computer," Aubin said. "So far, Cooper pair boxes used in qubits are much larger than the Anderson limit. Upon reducing the size of the Cooper pair box, quantum computer engineers will eventually have to cope with superconductivity at the Anderson limit." How small can superconductors be? For isolated nanoparticles subject to quantum size effects, P.W. Anderson in 1959 conjectured that superconductivity could only exist when the electronic level spacing δ is smaller than the superconducting gap energy Δ. Here we report a scanning tunnelling spectroscopy study of superconducting lead (Pb) nanocrystals grown on the (110) surface of InAs. We find that for nanocrystals of lateral size smaller than the Fermi wavelength of the 2D electron gas at the surface of InAs, the electronic transmission of the interface is weak; this leads to Coulomb blockade and enables the extraction of electron addition energy of the nanocrystals. For large nanocrystals, the addition energy displays superconducting parity effect, a direct consequence of Cooper pairing. Studying this parity effect as a function of nanocrystal volume, we find the suppression of Cooper pairing when the mean electronic level spacing overcomes the superconducting gap energy, thus demonstrating unambiguously the validity of the Anderson criterion. Depends upon what scale, controls over the applied fields. What is superconductivity? Consider the relationship of a + charge, colliding with negative charge within a field. That event is the smallest superconductor. Nothing else around.